Each year, over 2 million Brits head off on a cruise. With travel insurance a requirement for most if not all cruise lines, our aim is to help our readers determine whether P&O Cruises Travel Insurance gives them a strong insurance plan and good value for money. Perhaps P&O Cruise Travellers would be better off shopping around for their Cruise Travel Insurance. Let’s see. P&O Cruises is the oldest cruise line in the world, having operated the world’s first passenger cruise ship in 1837. P&O began life as “The Peninsular Steam Navigation Company“, but in 1840 the word “Oriental” was added to reflect the company’s expanding services eastwards beyond the Iberian Peninsular to Egypt and the Orient. 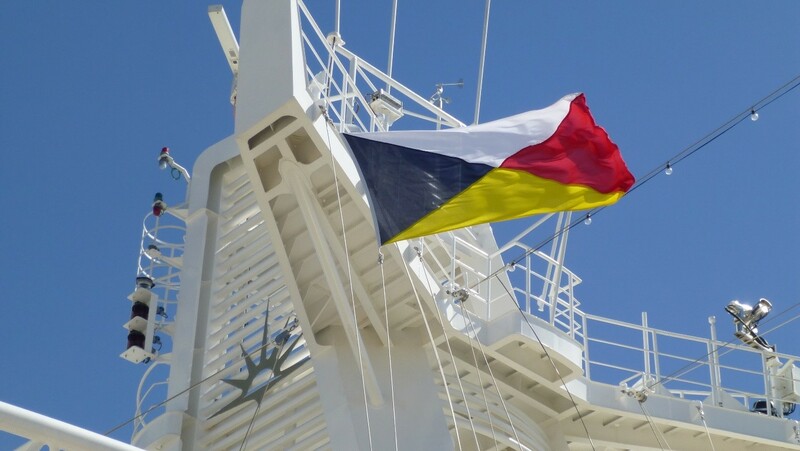 As a throw-back to P&O’s long seafaring heritage, even the P&O emblem, or “House Flag” as it is called, dates back to the company’s origins, and bears the colours of the royal families of Portugal (blue and white) and Spain (red and gold). The royal seal of approval was granted to Brodie McGhie Willcox and Arthur Anderson, two of P&O’s founders, following their support for the Legitimist causes in the Civil Wars in Portugal and Spain in the early 1830s. P&O Cruises has come a long way since its early days. The first P&O ship was the 206-ton paddle steamer the PS William Fawcett, which was owned by one of P&O’s founders, Captain Richard Bourne, and was first used on the Peninsular Steam Navigation Company’s service from London to Spain and Portugal in 1835. The prefix to the name of a ship denotes how it is powered. PS stands for Paddle Steamer, such as the PS William Fawcett, SS refers to a Steam Ship, such as the original SS Oriana which P&O launched in 1959, and finally, MV stands for Motor Vessel, with P&O’s most recent ship being the MV Britannia, which weighs in at a staggering 143,000 gross tonnes. 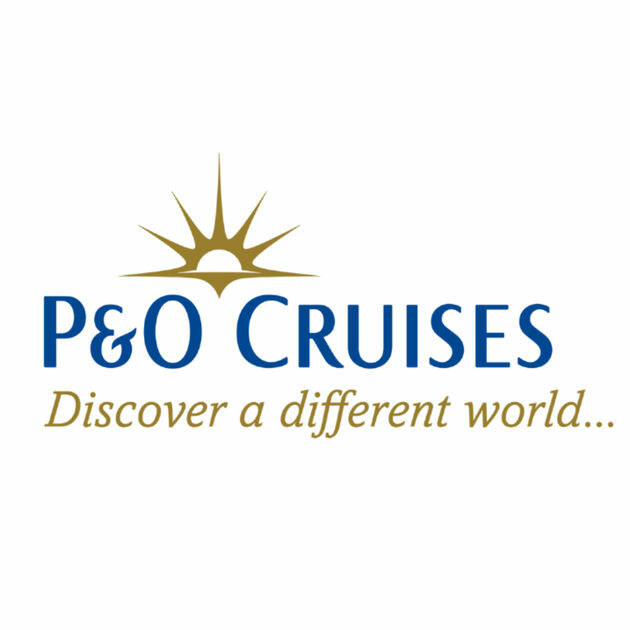 P&O Cruises was demerged from the P&O Group (which operates container and channel ferry services) in 2000 and became a subsidiary of P&O Princess Cruises. Just three years later, in 2003, P&O Princess Cruises merged with Carnival Cruises to form the current company, which is the Carnival Corporation & plc. As at 2018, P&O Cruises currently operate five ships out of the UK. The oldest ship is now the Oriana, which came into service in 1995. Other ships in the fleet include Azura, Ventura and Oceana, and the newest ship in the fleet is the Britannia. In 2012, as part of P&O’s 175th Anniversary Grand Event in Southampton, all seven of the ships P&O operated at that time assembled in port for the first time in history and sailed together. 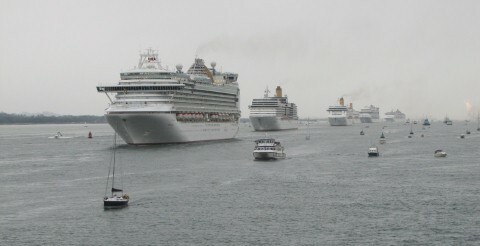 The ships proceeded in a line down Southampton Water. Adonia is followed by Ventura, then Arcadia, Aurora, Oriana, Azura and Oceana. P&O strives to give its passenger a memorable and stress-free holiday. From the moment you drive into either the Ocean Cruise Terminal or the original Mayflower Cruise Terminal in Southampton, your cases and car are whipped away by smiling, cheerful staff. The entire P&O ethos centres on the passenger experience, and it is something P&O is very good at. However, before you arrive in Southampton to take your cruise, you need to have booked the cruise itself and your cruise travel insurance. 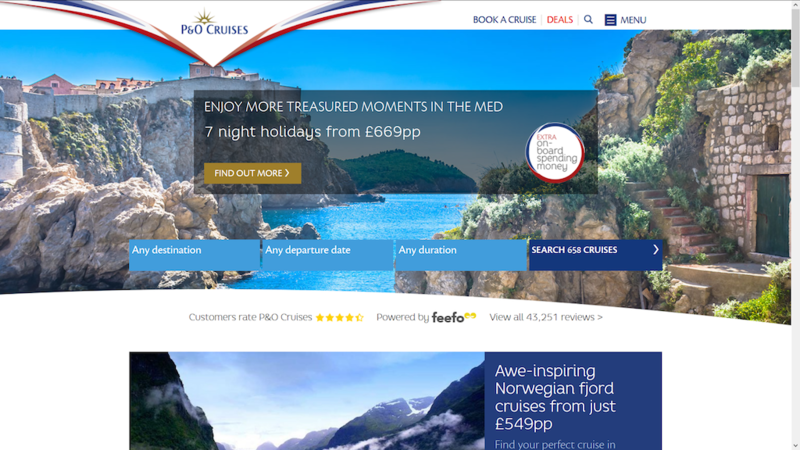 The P&O Cruises website is extremely slick, be it on a PC, Mac or mobile device. Finding and booking a cruise is simple. The hardest part is choosing the destination. If you are new to cruising and have heard horrors about the Bay of Biscay, don’t panic. It’s not as bad as people make out, especially on the large modern cruise ships that you will likely find yourself aboard. However, if you are a first-time cruiser and are somewhat anxious, why not try a simple seven-day trip to the Norwegian Fjords. They are simply breathtaking and are best seen from a ship. 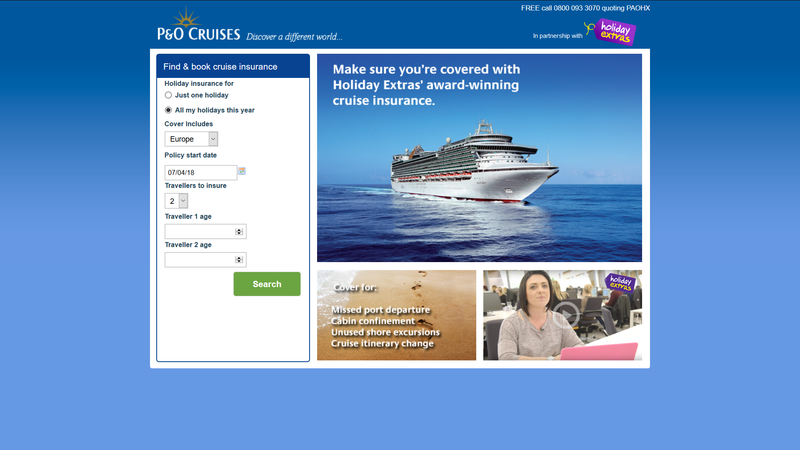 Given that all passengers on P&O Cruises are required to hold travel insurance, one would have thought that a commercial organisation the size of P&O would promote P&O Travel Insurance as frequently as possible to try to drive additional revenue. However, the opposite is true. 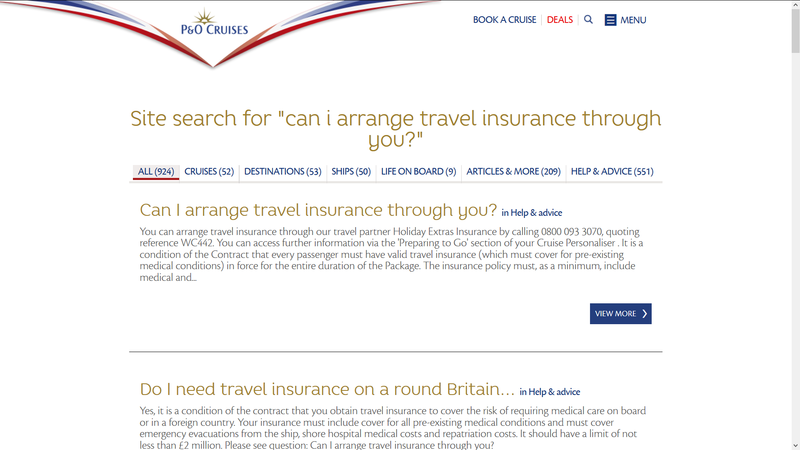 When one navigates around the P&O Cruises website, there is no obvious mention of P&O Cruises Travel Insurance. It does not seem to exist. We find this curious, as most cruise providers across the globe up-sell their own branded travel insurance. Typically, the trip insurance that a cruise company sells is very expensive and lacking in the level of cover that we would typically recommend to a traveller. P&O Cruises seems to be a welcome exception to the rule – P&O does not push its own cover. 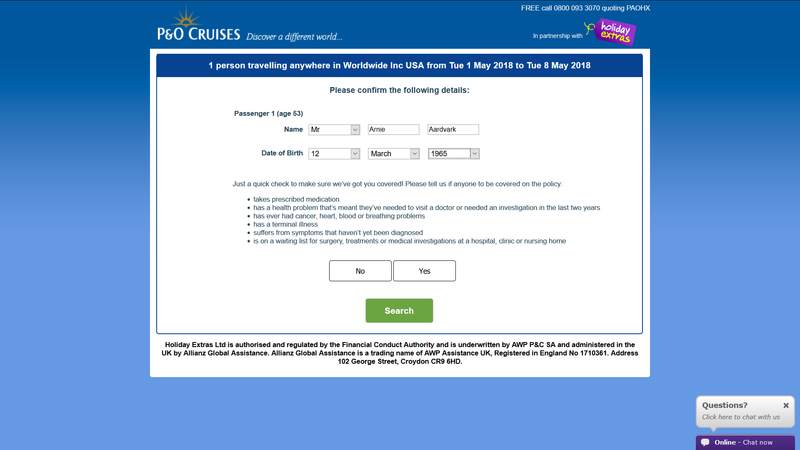 To find out whether P&O Cruises offers travel insurance, we needed to go to the search facility on the P&O Cruises website and physically search for the word ‘insurance’. 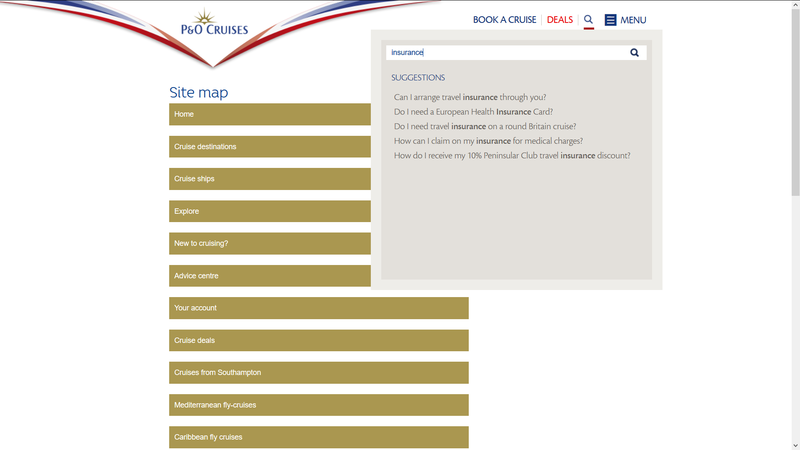 Only then did we find a result on the P&O site which talks about P&O Travel Insurance. 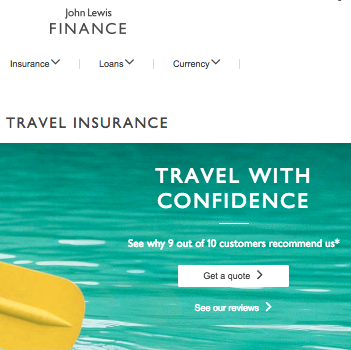 This is not a company trying to ‘push’ travel insurance on its customers. However, having found the P&O Cruises Travel Insurance partner, we must now review the insurance plans available and compare prices against what would be available if our traveller shopped around. 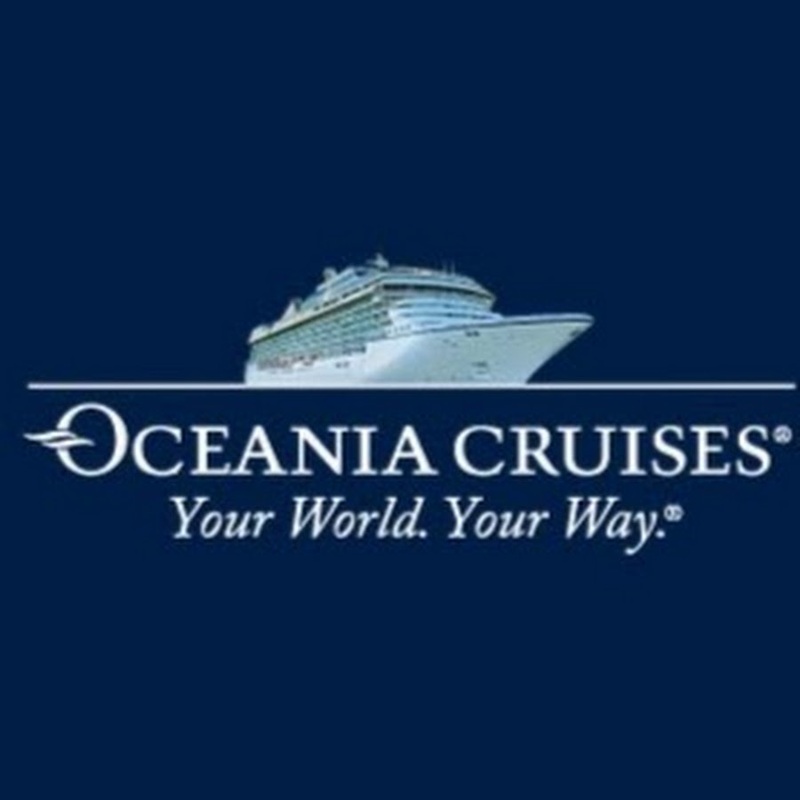 Having selected the hyperlink to the P&O Cruises Travel Insurance partner, we are directed to a page that is branded as P&O Cruises and offers our traveller a simple choice of one single trip, or an annual trip insurance. We are asked to select the destination for our trip, the start date, end date, and the number of people travelling. 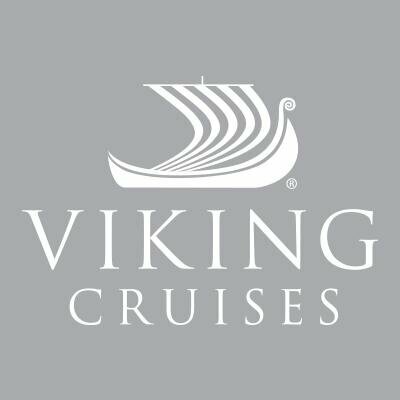 For our search criteria comparison we are travelling from 1st May to 8th May 2018 in the United States on a fly/cruise, so we selected USA. We are travelling on our own and we are 53 years of age. Having input these details, we then move onto another screen where we must input our full name, date of birth and we are required to confirm several statements regarding our general health. We can see in the footer of the page that the company providing the insurance cover is Allianz Global Assistance. We have come across Allianz providing cover for airlines and cruise firms in the United States before now, and without exception every plan offered has had poor cover and a high price. It will therefore be of interest to see whether the plan offered via P&O Cruises Travel Insurance partner continues this trend. Once we have selected ‘No’ to these pre-existing condition questions, we then hit the search button and a few plans and prices are shown to us. The plans offered take the route of the standard ‘good’, ‘better,’ ‘best’ mentality. We have a Carnival Cruise Silver plan and a Carnival Cruise Gold plan. We are also offered the same Silver and Gold for the annual insurance plan. The price of the Silver single trip plan is £44.53 whilst the Gold plan is priced at £50.78. The summary below each plan gives us the cover levels of Cancellation benefit, Medical benefit and Baggage benefit. Whilst these are only a small number of the cover types contained within the plans, they are probably the most significant to compare against for most travellers. The Silver plan has £5,000 of cancellation, £5 million of medical and £1,500 of baggage. The Gold plan has £7,500 of cancellation, £5 million of medical and £1,500 of baggage. To better understand the terms of the plans on offer we can select the link for Full Policy Wording. When this opens on our screen we can see that both plans’ terms and conditions are contained within the same document. The policy is entitled Holiday Extras Cruise Travel Insurance and the Allianz brand logo is visible. The policy runs to 24 pages in quite small font, which we found a little hard to read until we magnified our screen. The policy has an easy-to-navigate index and a clear, concise Summary of Benefits page with both the Silver and Gold single trip plans shown against each other for ease of comparison. However, we are still only comparing two plans from the same provider. The question we must ask is whether our traveller would get better value for money and more cover by shopping around. One thing we immediately note on the summary of cover is that there are minimal differences between the Silver and the Gold plan. Cancellation benefit on the Gold is £5,000 versus £1,500 on the Silver. However, that is practically the only place the differences lie. Only delayed departure and end supplier failure have improved cover levels on the Gold. 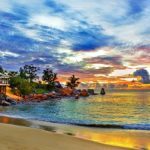 Having reviewed the P&O Cruises travel insurance plans, it is now necessary to step into what our traveller could achieve if they shopped around. 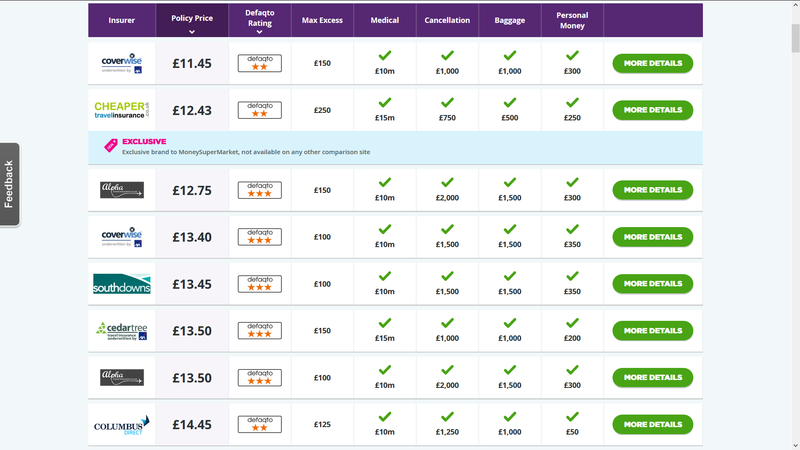 To compare travel insurance plans, we decided to go to one the UK’s many travel insurance comparison sites. We then added the exact same trip and traveller details for our traveller. By using the exact same search criteria, we can compare and contrast the cover being offered by the P&O Cruises and Allianz, so that our traveller can make an informed buying decision on their cruise travel insurance. 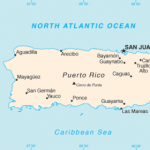 The comparison site offered us a significant selection of travel insurance plans to compare against. The travel insurance plans were presented in the order of best price first, but our traveller could also choose to filter the plans by excess level, cover levels, or by the defaqto rating of the plan. All the plans offered on the travel insurance comparison site offer medical cover of £10 million or more. This is double the £5 million offered by the P&O Cruises travel insurance plans. 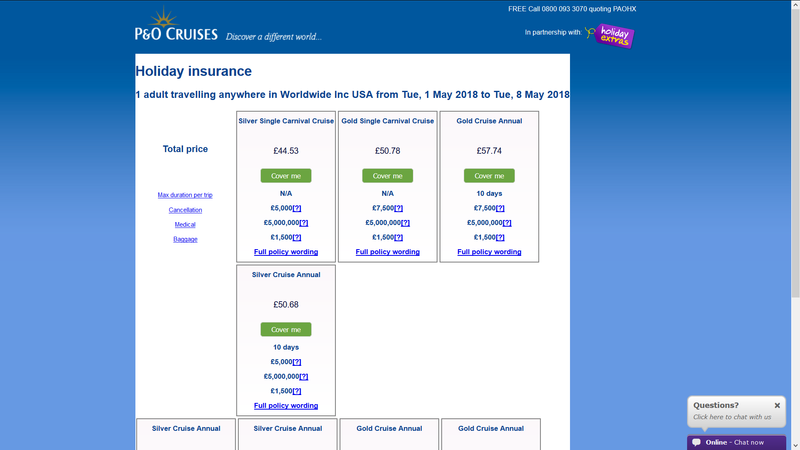 When we move on to compare cancellation cover, we can see that none of the cheapest comparison plans have the £7,500 and £5,000 level of cover offered by P&O Cruises Gold and Silver travel insurance plans. 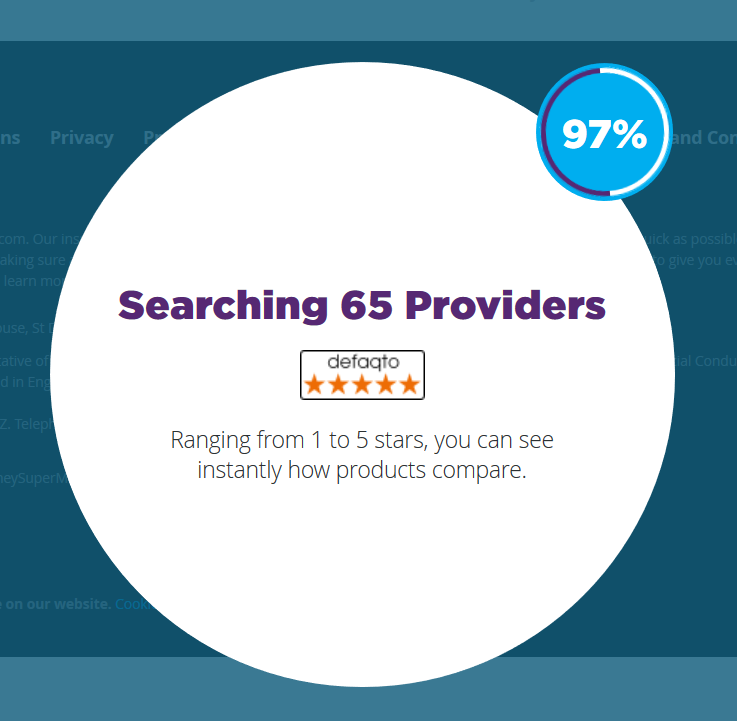 To find true comparisons for both the P&O Silver plan and the P&O Gold plan we decided to filter the comparison results by defaqto rating and chose to select just those plans that have the highest 5-star defaqto rating. Having done this, we can now compare and contrast the P&O Silver and Gold plans. 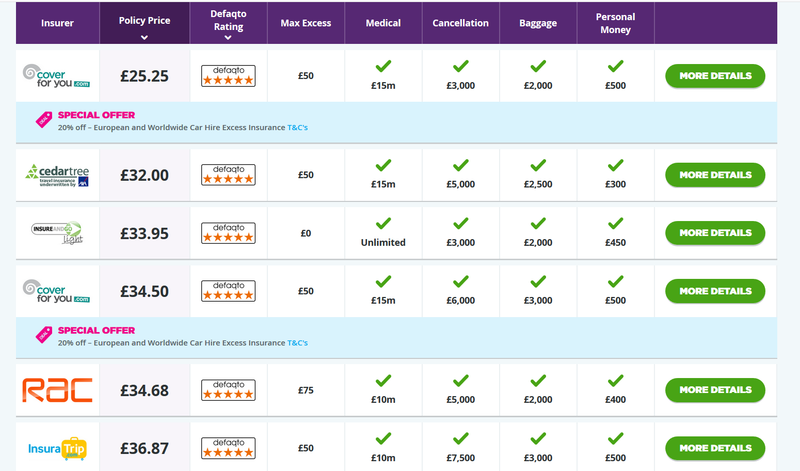 Price: £44.53 – The Silver plan has £5 million of medical cover, £5,000 of cancellation and £1,500 of baggage. Price: £50.78 – The Gold plan has £5 million of medical cover, £7,500 of cancellation and £1,500 of baggage. 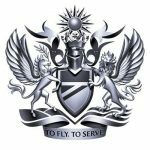 The best comparison for the Silver plan comes in at £32.00 and provides £15 million of medical, £5,000 of cancellation and £2,500 of baggage cover. This is three times the medical cover and over 50% more baggage cover for a plan that costs over £10 less than the P&O Cruises Silver Travel Insurance Plan. The best comparison for the Gold plan comes in at £36.87 and provides £10 million of medical cover, £7,500 of cancellation and £3,000 of baggage cover. This is twice as much medical cover and twice as much baggage cover, and all for a plan that costs £13 less than the P&O Cruises Gold Travel Insurance Plan. 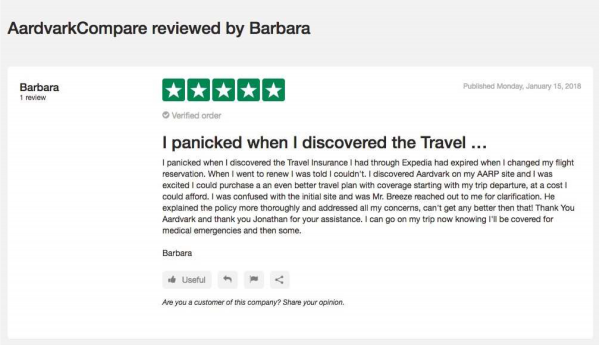 At AardvarkCompare we have reviewed numerous UK Travel Insurance Plans offered to loyal customers. What we see time and time again is a customer being offered less cover at a much higher price than if they had shopped around. Our advice, as always, is to shop around. If you are offered just two travel insurance plans from the same provider, go and check online to see if you are getting best value and cover for your money. Safe travels and happy cruising!